1. Anderson Products have been made in America since 1946. Not long after the end of World War II, L.W. "Andy" Anderson started Standard Plywoods Incorporated. This start up, family owned and run company would live on to become the famed Anderson Floors that we know and love over six decades later. The company has always been based in the Carolinas and has always been a major employer for hard working Americans throughout the many economic ups and downs this country has seen. The company is now a subsidiary of Shaw Industries, but still remains it's independent brand name due to the impecable reputation that it holds among the flooring industry. The company has always been a family business, and still continues to be one with Don Finkell (an Anderson family member) as their CEO. This manufacturer is a shining example of what respectable business in this country used to be, and of what it still can be. 2. Anderson is a leader in sustainable products among the Flooring Industry. 3. Anderson sets the bar for style and design with their products. 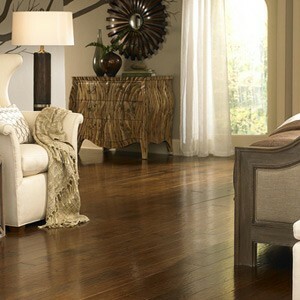 The hardwood styles brought to us by Anderson Floor's are some of the finest in the industry. They combine the beauty and elegance that consumers dream of, while still managing to maintain the the quality and durability that we need. Anderson hardwood is always on the forefront of the newest styles and trends of Interior design. One reason that they stay so up to date is due to the fact that they are a partner to the American Society of Interior Designers. Their research and development teams work hand in hand with the top interior designers in the country to keep bringing us some of the most outstanding hardwood products in the world. 4. Anderson stands out due to expert hand craftsmanship of their floors. What is it that gives quality hardwood that extra flare that makes it unforgettable? It is the different textures that give it that coveted rustic look. Anderson knows the importance of such details, and that is why they go to such lengths to ensure that their products exemplify those aspects. The use hand crafting techniques such as hand-scraping, pebbling, a wire brushing to bring a unique style and look to each and every board. They even make the boast that their disigners are so skilled, that no two boards look the same. 5. Anderson excels in customer service and support. Hardwood installation can often be tricky, and sometimes not everything goes as planned. Luckily the people at Anderson Floors know this and do everything in their power to make the experience as easy as possible for the consumer. They save you time, effort, and money by making their hardwood with no-wax, factory applied finish. This is why their hardwood is ready to install as soon as you take it out of the box. Anderson hardwood uses what they call their Cross Locked Engineered process, which locks the boards together to increase durabilty and resilience. Their warranties vary from product to product but rest assured that no matter which you choose, you will be covered by limited warranties of up to at least 15 years. They also stand behind their products with exceptional customer support at Andersonfloors.com or by phone weekdays from 8 AM to 5 PM eastern time.